Canned tomatoes are a staple in my household. They are amazing in Spanish rice (made by my husband), salsa, lasagna, pasta, cabbage soup, and tons more recipes. Red Gold is one of my favorite brands. The tomatoes taste fresh and add a lot of flavor to any type of meal. They sell many different varieties including sauces, diced tomatoes, ketchup, pasta sauces, etc. I was sent a few cans of their tomatoes, a cookbook, flashdrive, etc. Something that my husband and I talk about all the time is how tomatoes are used in every culture for different signature recipes. Mexico uses them in salsa. Italy uses them in sauces for their different dishes. Poland uses them in their stuffed cabbage rolls. They are so versatile and these canned ones are quick to use. 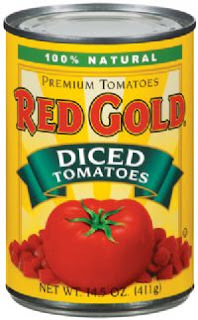 **Please note, canned tomatoes do contain a lot of sodium so use carefully. I would recommend not adding salt to a recipe using these tomatoes. The giveaway will be for a really sweet kit of Red Gold products (a flash drive, magnet, tomatoes, model car, keychain, reusable bag, etc). The giveaway is open until Midnight on Tuesday June 14th. Winner will be chosen on Wednesday June 15th using Random.org. The winner will have 48 hours to respond or a new winner will be chosen. Tell me what your favorite recipe using canned tomatoes is! -Like Red Gold on Facebook (2 entries). -Follow Red Gold on Twitter (2 entries). my fav recipe for using canned tomatoes is Hungarian Barley Stew! It's awesome! GFC new follower from Surfin' Saturdays. What a lovely blog you have! I like using them in my santa fe casserole. I like you on fb 1. I like red gold on fb 1. I like red gold on fb 2. Hello, there!! New follower from the Saturday Spotlight, hope you'll come on over and look around at my page :) I'm new to this, and have tons of tabs that I'm trying to fulfill with some awesome Blogging Mommies. I'm a new follower from Surfin' Saturday. love making spicy tomato sauce with basil and roasted garlic! My favorite tomato recipe is marinara sauce! I like using canned tomatoes in chili. My favorite recipe using canned tomatoes is spaghetti sauce (with meatballs of course!). Thanks! i loved using canned tomatoes in a vegetable soup! also in the lovemode giveaway! My favourite recipe using canned tomatoes is spaghetti sauce. I am following Red Gold on Twitter. Spaghetti for sure but I also make it into a sauce and eat it with salmon. Yum!! I already subscribe to via email. I use canned tomatoes in so many things, but our favorite is probably a vegetarian pasta recipe that I make. My favorite recipe with canned tomatoes is for a spaghetti sauce. I liked Red Gold on FB. I liked the Nutritionalist Review on FB. I subscribed to the blog on Google Friend connect. My favorite recipe using canned tomatoes is Tortilla Soup. I use Italian tomatoes from a can and elbow noodles and butter. Yum! Our family's favorite recipe that uses canned tomatoes is a baked spaghetti casserole called "Confetti Spaghetti". I use them to make spanish rice. my favorite dish with canned tomatoes is lasagna with homemade pasta sauce! I love to make stewed zucchini! My favorite recipe would be taco soup. Easy and yummy. Pepperoni Pizza Pasta in the crock pot is the best! In the winter I make a decent tomato soup with canned tomatoes. I love to use them in my sauteed summer squash. the flavor or fresh veggies is so nice but tomatoes are perfect for canning and we love them in my house.